As Sterigenics poisons air in Willowbrook, County Board candidate Rashid pushes for shut down. CHICAGO (September 26, 2018)– Following revelations that a Willowbrook company, Sterigenics, has been pumping ethylene oxide, a cancer-causing chemical, into the air near a residential area, Cook County Board candidate Abdelnasser Rashid and local activists held a press conference Wednesday to call on the Illinois Environmental Protection Agency and U.S. Environmental Protection Agency to take immediate action to shut down Sterigenics until it can prove the public is no longer at risk. Rashid urged the County Board to pass a newly introduced resolution to hold Sterigenics accountable, and called on State’s Attorney Kim Foxx and Attorney General Lisa Madigan to consider legal action. Rashid is running against Republican incumbent Sean Morrison, who is also chair of the Cook County GOP, and one of Gov. Rauner’s biggest political boosters. 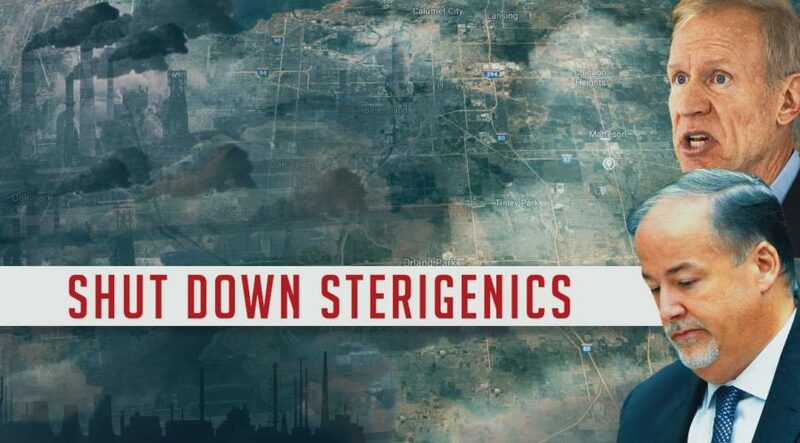 Commissioner Larry Suffredin (D-13th) introduced a County Board resolution on Monday calling on State’s Attorney Foxx to consider bringing a lawsuit to protect the health of residents around the Sterigenics plant. The resolution further asks that the U.S. Environmental Protection Agency and the Illinois Environmental Protection Agency act immediately to shut down Sterigenics until it can definitively prove that its operations pose no risk to public health. Rashid urged the County board to move swiftly to pass the Suffredin resolution.